During the official keynote Apple said “Messages is the most frequently used app on iOS”. This was the motivation behind the huge update for Messages app in iOS 8. The app in iOS 8 borrows many useful features from WhatsApp, SnapChat and other messaging apps. One of the new features is the ability to send short audio and video messages to all the owners of iOS and Mac devices. You can send both voice and video recordings. This feature is useful when you want to greet someone with your voice or want to share a precious moment of your life. 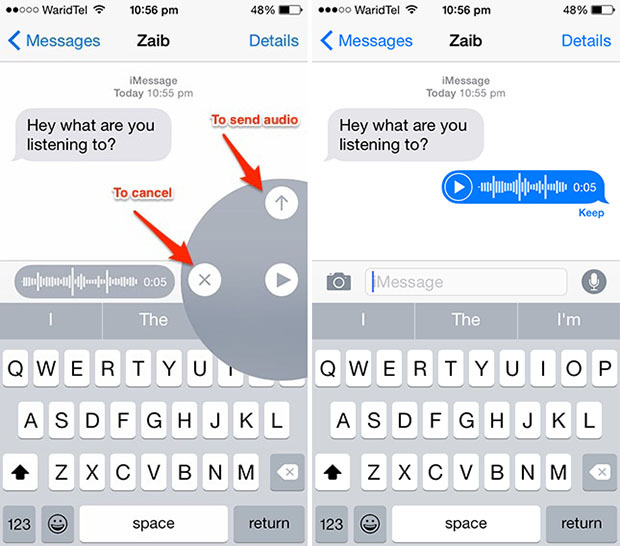 Follow the simple steps below to send audio/video messages via Messages app in iOS 8. Tap and hold the ‘Mic’ icon in front of the Messages app’s text box. 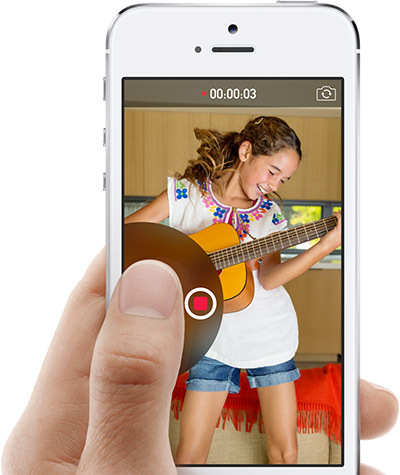 Take off your finger from ‘Mic’ icon, and play if you want check whether the recording is fine or not. If it is then tap the ‘Up arrow’ button to send the message. When finished recording just move your finger (without taking off) to ‘Up arrow’. The message will be sent. You will be able to hear it once it sent, however in the first case you can listen to it before sending. 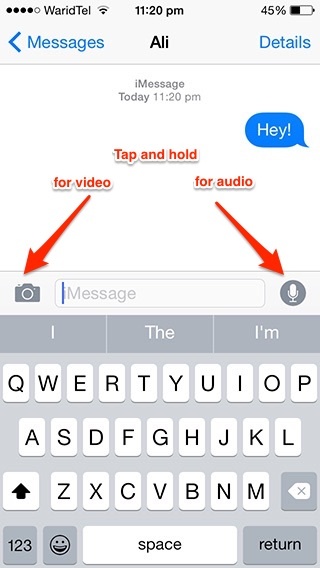 Tap and hold the ‘Camera’ icon located right of the Messages app’s text box. Once done recording, now you have same two options like the audio message above. Just directly send it by moving your finger to ‘Up arrow’ or release your finger, verify the recording and then tap the ‘Up arrow’ button. You can only send these messages to iOS and Mac devices running iOS 8+ and OS X Yosemite+ respectively. Stay tuned for more iOS 8 tips.